Please excuse the truancy of this feature. Deacon Brown experienced a loss of electrical power two weeks ago today, and therefore, has had some difficulty completing any tasks which require the use of electrically powered devices. Hopefully, Deacon Brown will be back on line soon, but in the meantime, he has asked me to fill in. I’m Deacon Right. We held Sunday School at Big Bethel Freewill Baptist Church on South Street today. We decided to stay off of the Grove’s dirt and gravel roads for fear of becoming bogged down in the red clay, as it threatened rain today. As a matter of fact, we’ve had to deal with the muddy roads on second Sunday for the last couple of months. Maybe someday, the Lord will light a fire under our County Government, urging them to pave, or at least re-gravel our roads. We’ll pray! 14 “O Lord God of Israel, there is no God like you in all of heaven and earth. You are the God who keeps his kind promises to all those who obey you and who are anxious to do your will. 15 And you have kept your promise to my father David,[a] as is evident today. 16 And now, O God of Israel, carry out your further promise to him that ‘your descendants shall always reign over Israel if they will obey my laws as you have.’ 17 Yes, Lord God of Israel, please fulfill this promise too. 18 But will God really live upon the earth with men? Why, even the heaven and the heaven of heavens cannot contain you—how much less this Temple I have built! 19 “How I pray that you will heed my prayers, O Lord my God! Listen to my prayer that I am praying to you now! 20-21 Look down with favor day and night upon this Temple—upon this place where you have said that you would put your name. May you always hear and answer the prayers I will pray to you as I face toward this place. Listen to my prayers and to those of your people Israel when they pray toward this Temple; yes, hear us from heaven, and when you hear, forgive. To a child, forget ethics, crossing one’s fingers, while making a promise truly invalidated the promise. It was a common belief among my peers and I that we could nullify any promises made by simply crossing our fingers behind our backs. How convenient, right? Additionally, we’ve probably all witnessed one television character making a promise to another character, while secretly crossing his or her fingers, especially when the character is forced to make a vow, oath, or promise they don’t actually mean. They will cross their index and middle fingers in a way, hidden to the character they’re talking to, but visible to the audience, to show they’re actually lying. Most often the person will have their crossed fingers held behind their back, but off to the side, under a table, or somewhere else hidden. The general idea is that making this “secret” gesture, somehow, either protects one from the consequences of lying or absolves one from being held to one’s word to begin with. Promises made by and between people REALLY ARE just that easy to dismiss. They are as insubstantial as a breath of exhaled air, which once it exits the lungs diffuses into the invisible air around us. Here’s a test: Place your closed fist to your lips as you would if it was cold and you were trying to warm your hand, then speak a word of your choice into that fist. Now, open the fist. What do you see? Do you see the word you just deposited there? NO. That’s man’s promise, whether to another person, or to God Himself. You can’t hold that breathed word for safe-keeping. You can’t deposit it in the bank. You can’t trade it for material goods. Likewise, you can’t hold people to promises they make. Maybe they’ll keep their promises, maybe they won’t. Maybe YOU’LL keep YOUR promises and maybe not. But GOD! As we learned in today’s lesson God ALWAYS keeps His promises. He always answers prayer. 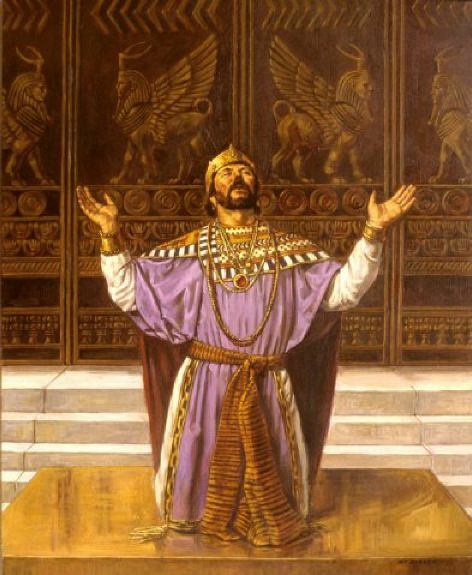 Solomon didn’t pray that prayer for God’s benefit. God doesn’t need our reminders of the promises that He has made, nor does He need to be urged to keep His promises. He knows all of the promises He’s made and all of the promises He has kept. Next STORY “TIME”: WHAT TIME IS IT?